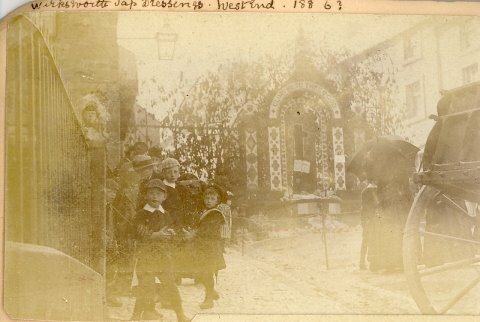 Photos taken from a Nowell-Usticke photo album, dated about 1888, sent in by Brenda Pearson, thanks Brenda. "I discovered these photos I have sent you are from Elizabeth Nowell-Usticke nee Wright photo album. She named everything beautifully and now we are benefiting from her efforts.It has made my "job" much easier! 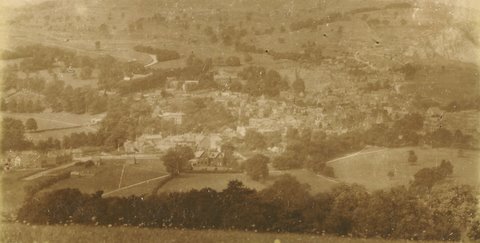 Elizabeth Wright was a daughter of Charles Wright, who ran a wine and spirits business in Wirksworth. She married William Nowell-Ustike (a brewer from Glasgow) at Wirksworth in 1889. The photographs in her album were taken before her marriage. 01 Wirksworth, West End,1887 Looking East, down a hill towards the Market Place. On the left is probably 32 West End. On the left is written "Joe Brooks", on the right "Salo?" 02 Wirksworth, Market Place. A cart with horse stands under the gaslight. The buildings in the background are 9-11, Market Place, opposite the Town Hall. Could those be "swing boats" in the Market? 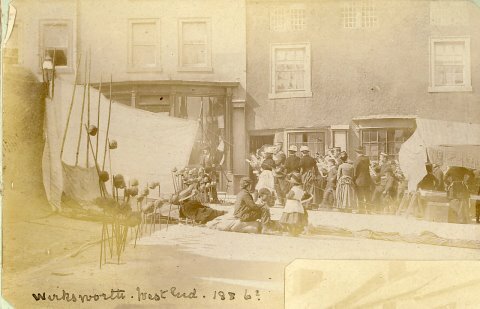 03 Wirksworth, St John Street, 1887. 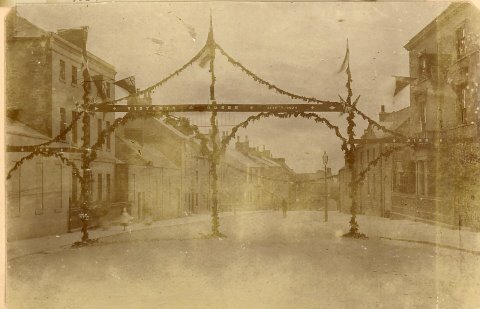 Celebrational Arch for Queen Victoria's Golden Jubilee on 20 June 1887. 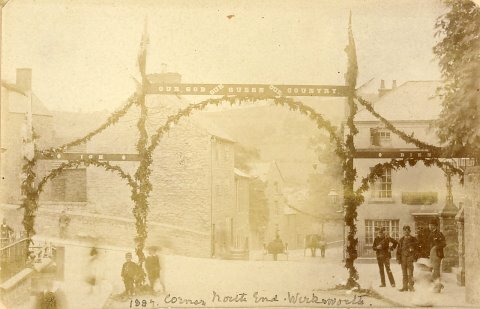 The arch reads: "Victoria Queen", "Ich Dien" and probably "1837-1887"
07 Wirksworth, North End 1887. Celebrational Arch for Queen Victoria's Golden Jubilee on 20 June 1887. The arch reads: "Our God and Queen and Country" and "Ich Dien"
05 Wirksworth, Market Place, 1886 The market, held every Tuesday, has been held in Wirksworth since 1306. Could the curious objects be toy windmills on sticks? Bird scarers? This photo joins photo 11. 08 High Peak Railway Locomotive and staff in snow at Manystones cutting, at the top of Hopton Incline. 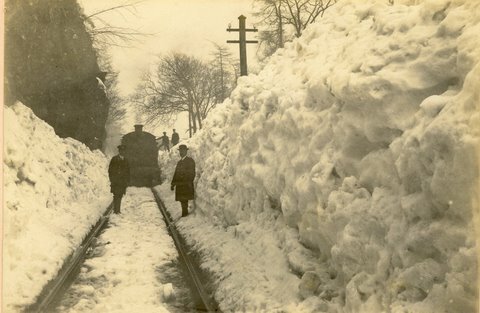 This is probably the very severe winter of 1919 when the drifts of 5ft to 8ft brought chaos for several days. 09 Wirksworth. Looking down on the town from a hill to the east called "The Gilkin". 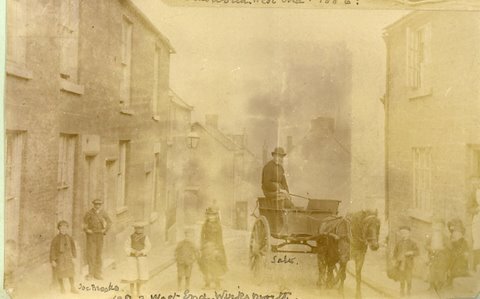 04 Wirksworth, Tap Dressing, West End, 1886. In 1827 water in wooden pipes was brought from the Moor to taps in seven parts of the town. The taps were dressed at a Festival held on the Wednesday of Whit week. This may have been opposite the Wheatsheaf Inn. An umbrella may show it has started to rain. 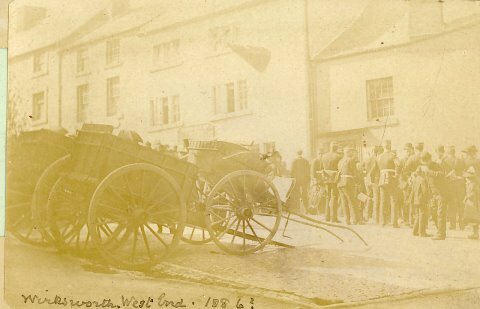 10 Wirksworth, West End 1886 Three carts (minus horses) are parked next to a group of soldiers. This photo joins photo 04. These seem to be two alleys of "Bladder Shyes", often found as sidestalls at funfairs and fetes in those days. These were like coconut shyes, with bladders instead of coconuts. There seem to be two "alleys" separated by a line made of old rolls of cloth and boxes. Three kids and one adult are sat on the rolls, their body language showing they are in charge of the alleys. Behind the far (active) alley, a large backcloth sheet is placed. A string can just be seen running from the far top corner of this sheet to the public end of the shy. Together with a stay pole and a short string to the nearby shop front, this helps support the sheet. The nearside of this backcloth seems to be attached to a gaslight. A lower side sheet appears on the near side of this alley, supported by five 8 ft straight hazel poles cut from coppice stools. The near (inactive) alley shows another backcloth wound round three such hazel poles. The floor of both alleys seem to be lined by similar groundsheets, the crowd would keep off these. Underneath these groundsheets, the large paving stones show that lined the Market place. Each alley has about 20 three foot sticks stuck vertically at the far end of the alley, holding what looks like an inflated bladder tied to the high end. Could these be the proverbial pigs bladder, used by jesters for centuries? Pig's bladders hold about 2 litres, and can be blown up and tied to a stick with string, and will "pop". They are used in Morris Dancing (the fool is called a "bladder-man"), and made early footballs, rugby balls, and water polo balls. At the right (public) end of the shy, there is a pole keeping the public off the active shy. Next to it a table with an adult attendant. The game may be played by a member of the public placing money on the table, taking some objects in exchange, which he throws at the bladders, attempting to burst them with a loud "pop". Usually he misses, or the missile bounces off the bladder. The little boys collect up the missiles, while the throwers friends jeer his poor throwing. The missile might have been a short stick with a pointed end, difficult to throw without rotating, which would only burst the bladder if the point hit exactly right, perhaps 1 chance in (20°/360°)= 1 in 18! The Anglo-Zulu Wars (1879) were still vivid in the memory, so perhaps "spears" of sharpened poles might have been used, offering more skill and less chance. Those five poles holding up a sidesheet seem to have sharpened points....! I was fascinated by the images on your website of the coconut sheets at Wirksworth Fair. These are probably the earliest images I have seen of this attraction. The cocnut stands or pegs in this early version of the game are not surrounded by any type of stall as is the case later. By the 20th century there were London Sheets and Yorkshire Sheets. The London sheets were usually more open, whilst the Yorkshire Sheets were covered in canvas. Also the showmen usually stood 'duds' on the pegs. These were wooden and covered in coconut hair. the idea was that the goods won would not be damaged, although the authorities did not always see it that way! ----------------------------- Dear John, For various reasons, I've recently been giving some more thought to the photographs on your site from "Elizabeth Wright's Album 1888": http://www.wirksworth.org.uk/B67-ALBM.htm As you are already aware, several travelling photographers were associated with fair grounds, and I am interested in the connections between these folk. I have returned to those photographs time and time again, hoping to find some clues as to how I could link these fair ground folk with the ones who showed up at the Morledge in Derby from time to time. The more I have read about them, the more I realise that they were a fairly tight-knit group who travelled throughout the Midlands, attending various fairs, market days and other occasions, obviously having a good knowledge of when these events were going to be held each year. 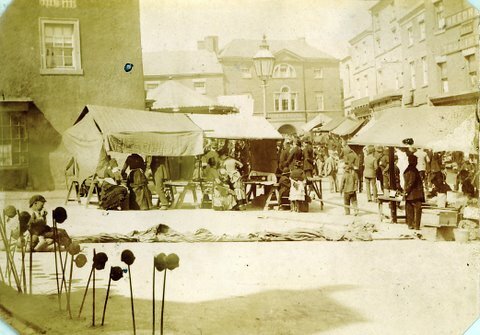 "In the Market Place were assembled the usual contingent of shooting galleries, shows, &c."
One of the photos on your web page also refers to the tap dressings, so it appears to be the same occasion, which was "Whitsun-Wednesday." I think this may have been Wed 31 May, which was the first Wednesday after Whitsunday, Pentecost. I would very much like to write up something on this topic for my web site, Photo-Sleuth, perhaps even a series of articles on travelling photographers & fairgrounds. I wonder if I might use your photos to illustrate this story, please? 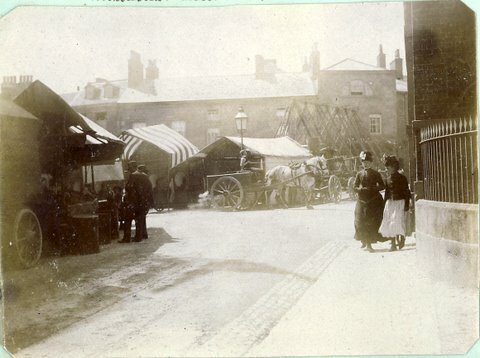 If you wouldn't mind, could I please have some detailed scans of the photographs which feature Market Place? I will, of course, email Brenda Pearson if you like, and would acknowledge the source of the photos as usual. My instinctive reaction would not be Aunt Sally but a forerunner of the coconut shy sounds right. Aunt Sally always seems to be played singly. Also Aunt Sally was around at about this time, too, and the dolls were generally speaking dressed up to look like a woman whereas these are not. The popping thing sounds v. plausible because they don't look to be set up to be knocked off the pole. I'd like to know your sources for the info. Re.The 13C reference; I suspect that may be a bit dubious. But where did you find this stuff on Bladder Shyes? I have lots of books but have never seen it, regrettably. I have done a search on the OED and could not find the term bladder shy (under any spelling of shy). The earliest reference to Coconut Shy in there is only 1902. I wonder if the game went by another name. Also, do you have the enlargements you mention scanned in? ; I'd love to see them. Surely there is some clue on there somewhere as to what the projectiles might be?? ?